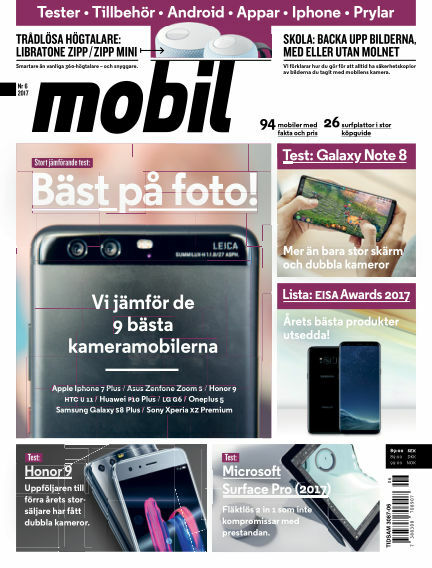 In this issue of Mobil Sverige : Stort test - vi jämför de 9 bästa kameramobilerna: Apple Iphone 7 Plus / Asus Zenfone Zoom 5 / Honor 9 / HTC U 11 / Huawei P10 Plus / LG G6 / Oneplus 5 / Samsung Galaxy S8 Plus / Sony Xperia XZ Premium. Mer tester: Galaxy Note 8, Honor 9, Microsoft Surface Pro (2017). Lista: EISA Awards 2017, trådlösa högtalare, skola: spara dina bilder, med eller utan molnet. With Readly you can read Mobil Sverige (issue 2017-10-03) and thousands of other magazines on your tablet and smartphone. Get access to all with just one subscription. New releases and back issues – all included.